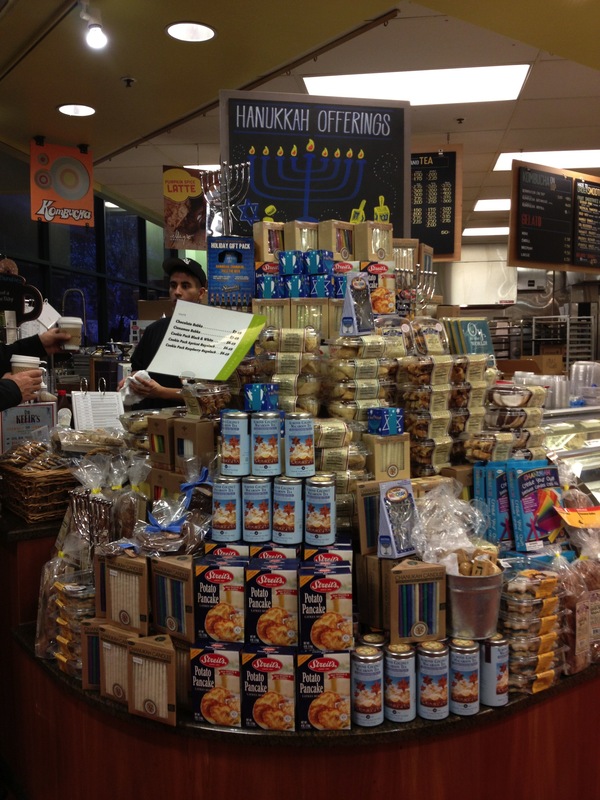 Hanukkah is almost here, bringing with it blue and white store displays with towers of candles, menorahs, dreidels, candies and cookies, and boxed potato pancakes. Latkes are traditional Hanukkah food (the oil they are fried in represents the lamp oil that miraculously lasted for eight days). My Jewish mother, who always had a “Hanukkah corner” amidst all the Christmas decorations, relied on the packaged variety (Manischewitz, anyone?). l loved these as a kid, but they lack the flavor and texture of freshly shredded potatoes mixed with onions and fried until crispy and delicious. Oddly enough, it was my German-Catholic paternal grandmother who taught me to make latkes, frying them up in heaping tablespoonfuls of Crisco (yikes!). 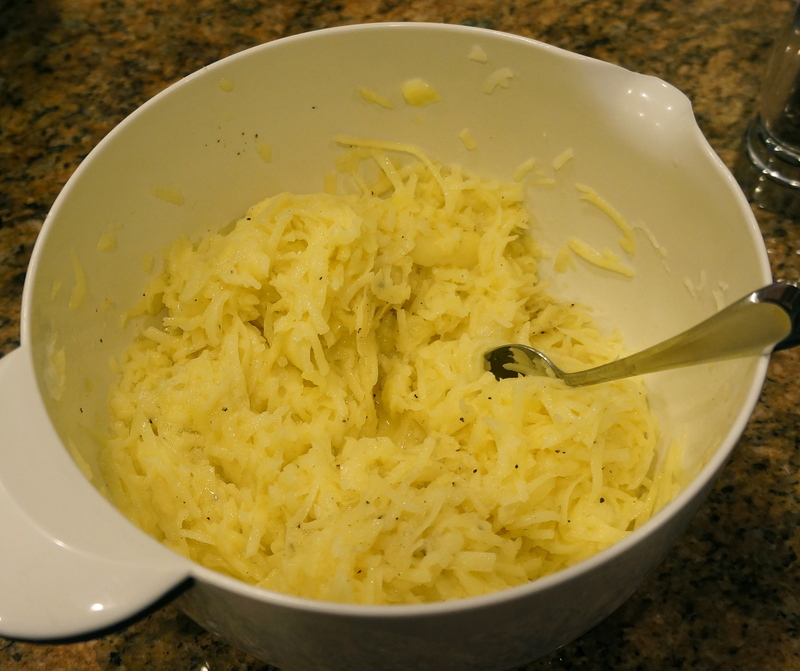 She also added breadcrumbs, which I have omitted, but the remaining method is the same: shred potatoes, mix with diced onion and eggs, season with salt and pepper, and fry ’em up. While Mom is Jewish (Dad’s not), she is not kosher or particularly religious, and has been known to enjoy all sorts of pork products. 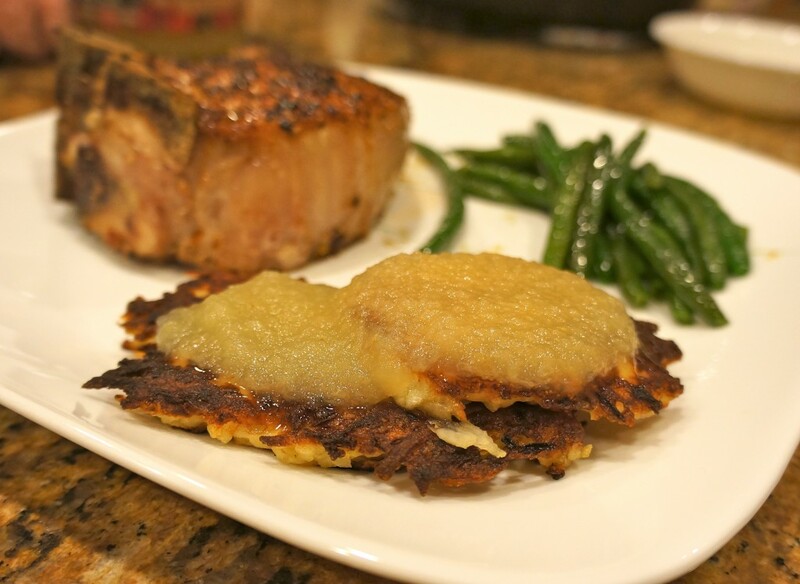 Whenever we had latkes growing up, we usually served them with pork chops, so this is what I did tonight. And, since I had some lovely lard (the unhydrogenated kind) from a local butcher, I decided to fry up my latkes using the rendered pig fat…and it was amazing! I even fried a batch in coconut oil to compare the two and the lard was the clear winner. If you can’t find a good source of unhydrogenated lard, I would recommend refined coconut oil (not virgin) so that you don’t have coconutty-tasting latkes. Now, I know that potatoes aren’t necessarily considered Paleo, but they are a nutrient-rich source of dense carbohydrates and we love them! These latkes are a comfort food and one that is near to my heart both in taste (the German in me loves those potatoes!) and in sentiment (they connect me to Granny as well as to my Jewish heritage). Use sweet potatoes instead of russet potatoes, or a mixture of the two. Replace a cup or more of the russet potatoes with shredded carrots, shredded zucchini (drain this well), or other root vegetables. Add a bit of almond flour or coconut flour to thicken the batter. Use different spices for different flavor profiles. 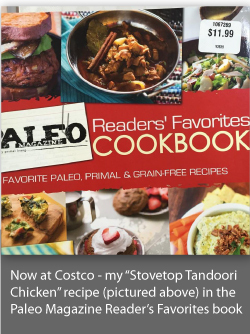 Also, don’t forget about my Practical Paleo giveaway! Only one more week to enter to win this amazing book. Find out how to enter here. This giveaway is over! 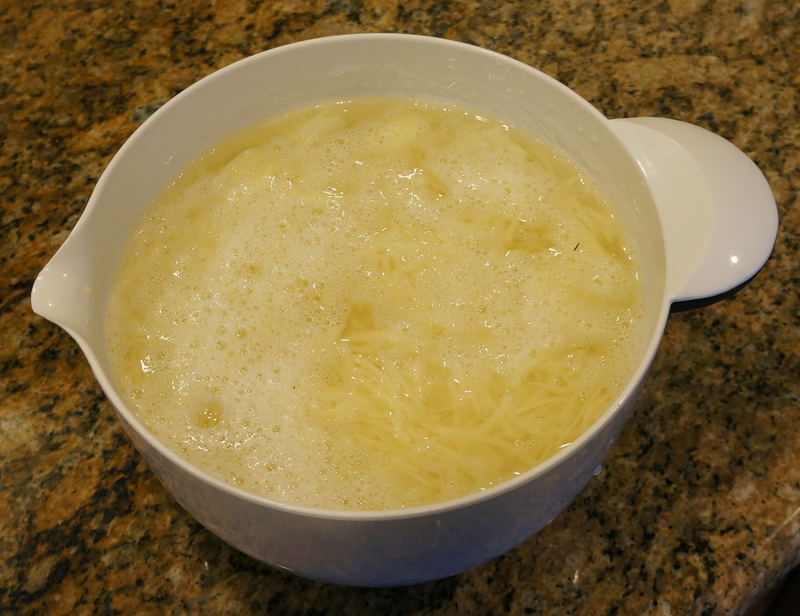 Using a food processor or by hand, dice the onions; remove from food processor bowl. 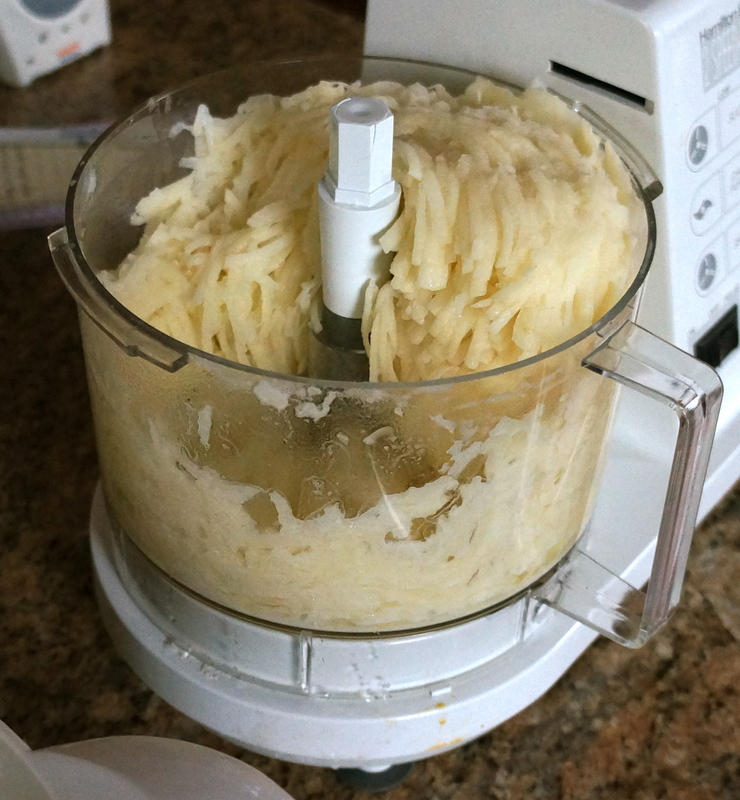 Peel the potatoes and then shred them in the food processor using the shredding blade. You can also shred them with a box grater. Place shredded potatoes in a large bowl of cold water for a few minutes (this helps to remove some of the starch and it keeps them from turning black). 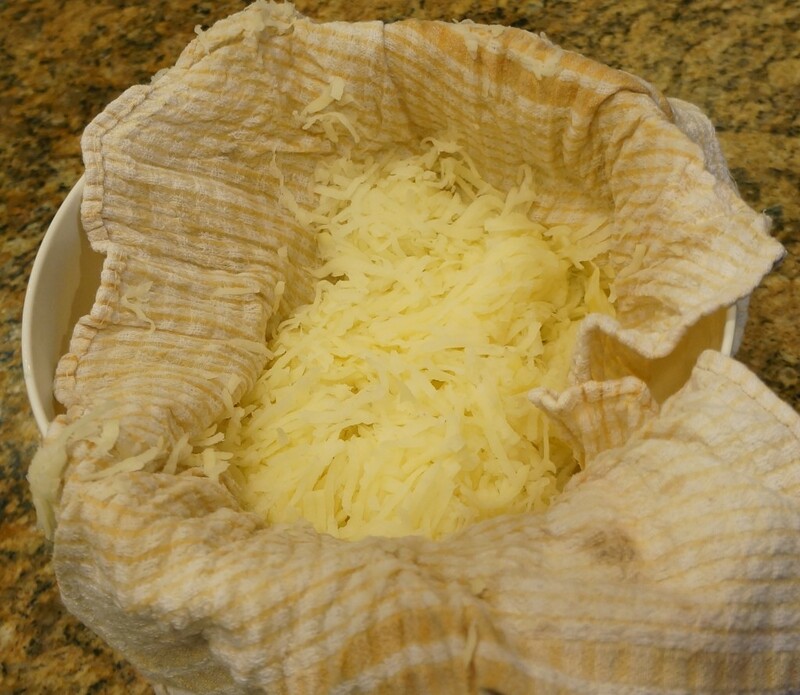 Drain the water from the potatoes, then place them in a cheesecloth or clean kitchen towel and squeeze out as much moisture as you can. Mix the potatoes with the onions in a large bowl. In a separate bowl, beat the eggs until they are scrambled well. Mix them into the potatoes and onions. Season the potato mixture with sea salt and pepper. Heat a cast iron skillet until hot. Add a large tablespoonful of lard or other cooking fat (enough to form a think layer on the bottom of the pan). At this point, I like to make a test latke so that I can check the seasoning. Adjust as needed. 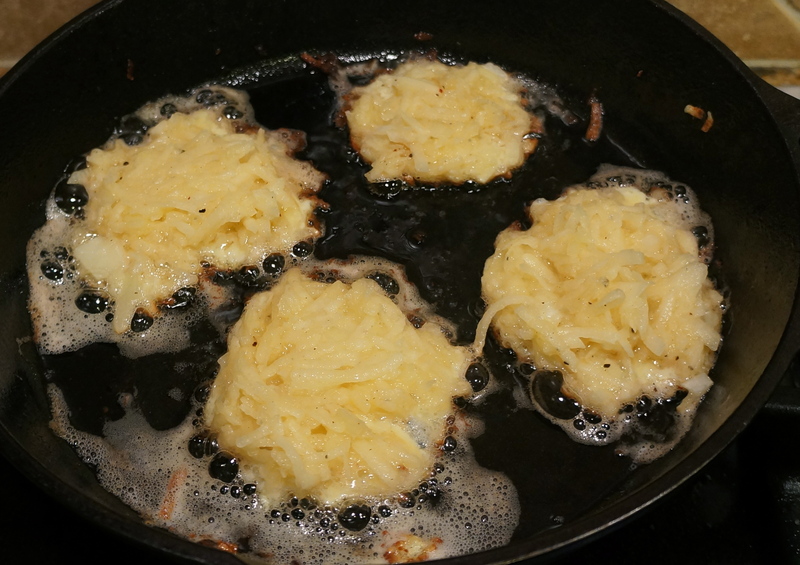 Form the latkes by placing heaping tablespoonfuls of the potato mixture in the hot pan. Cook 4-5 minutes per side, flipping once, until dark golden brown and cooked throughout. Serve with unsweetened applesauce (preferably organic). Enjoy! Dinner! 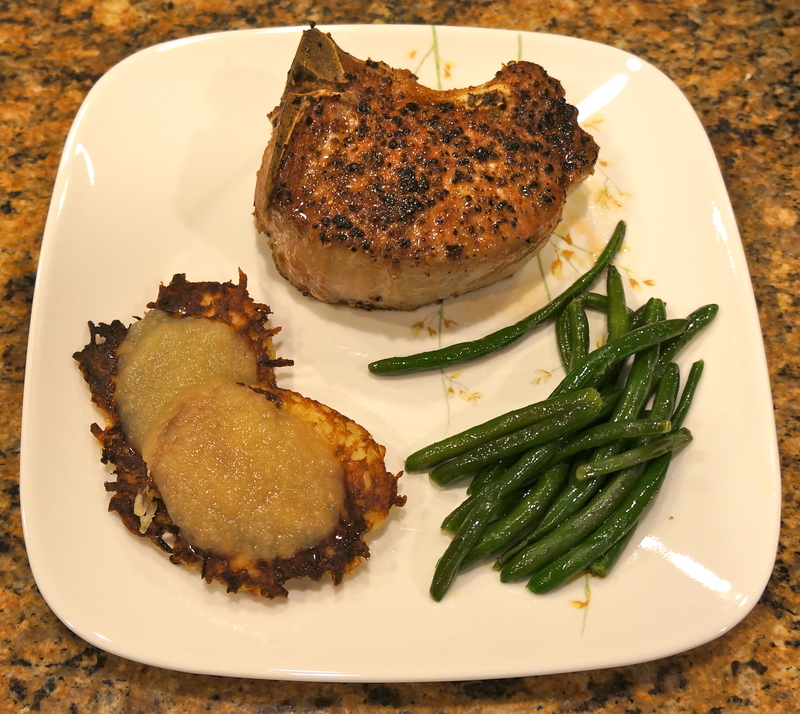 A thick-cut pork chop, green beans cooked in ghee, and latkes with unsweetened applesauce. Crispy and delicious. And look at that pork chop! This post is linked to Tasty Traditions, Monday Mania, Real Food Wednesday, and Fight Back Friday. I guess I’ll just have to make some for you next time I see you, Auntie!